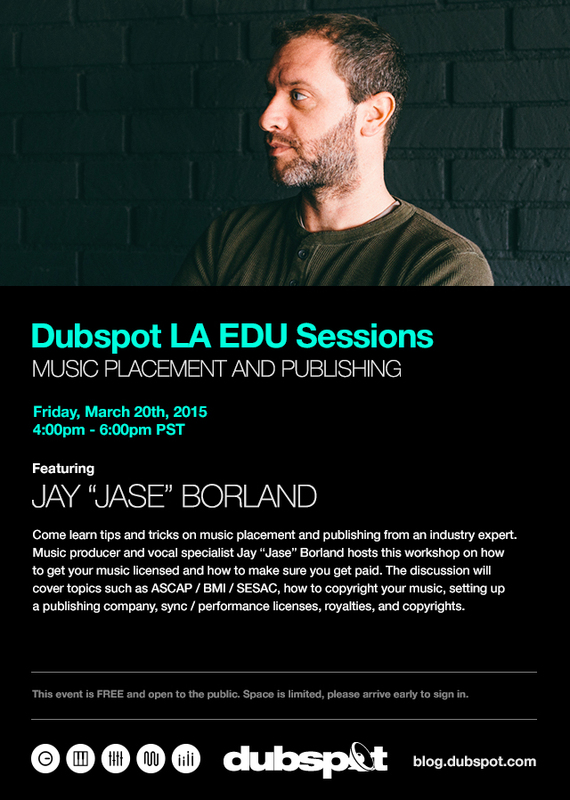 On Friday March 20th, join us at Dubspot LA for an EDU Sessions workshop with beatboxer extraordinaire Jay “Jase” Borland to learn tips and tricks on music placement and publishing in the music industry. Join us for a free workshop to learn tips and tricks on music placement and publishing from an industry expert. Music producer and vocal specialist Jay “Jase” Borland hosts this workshop on how to get your music licensed and how to make sure you get paid. The discussion will cover topics such as ASCAP / BMI / SESAC, how to copyright your music, setting up a publishing company, sync / performance licenses, royalties, and copyrights. In addition, if you are an artist looking to submit music for licensing opportunities go to www.splymusic.com. Jay Borland (aka Jase) is an accomplished Beatboxer, DJ, and vocal performer who has worked with artists such as Lauryn Hill, Alanis, Aesop Rock, Junkie XL, Jungle Brothers, KRS-ONE, Black Sheep, Alanis Morissette, and Harry Connick Jr. Pushing the boundaries, this multi-talented vocal specialist continues to impress with his unique vocal sound effects and ability to adapt his voice for any type of recording. His improv and interactive performances display an impressive blend of human sound effects, beatboxing, DJing, voice-overs, and stand up comedy, all while encompassing today’s technology through electronic hardware and software. Jase’s live show will have you amazed as he beatboxes and scratches to remix or create original songs on the fly. You won’t be able to tell if it is man or machine. In 2004 Jase founded Verbal Beats, the first all vocal & beatboxing loop and sample licensing company.